The Harvest wireless solar powered online frost alarm systems are currently used in nine countries around the world. The systems are extensively used in vineyards, orchards and farms as an advanced frost alert system with live data reporting during frosts. In many cases it serves the dual purpose of collecting a variety of other weather variables including wind speed/direction, rainfall, relative humidity, barometric pressure, solar radiation, evapotranspiration, leaf wetness, Bacchus Botrytis risk, wet bulb, dewpoint, wind chill, soil moisture, soil temperature, water temperature and UV radiation. The systems can also monitor irrigation systems for water resource consents (water flow rate, accumulated totals, well depth and conductivity) and wind machines (battery voltage, oil pressure, fuel level, rpm and run hours). . 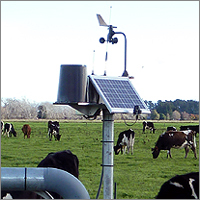 Harvest Electronics has a wide range of options for telemetered monitoring of weather conditions. Our automated weather stations (AWS) boast a high level of customisation ranging from entry level 'sensor options, to high end industrial sensors; including the ability to monitor Hydrological services rain gauges, and Vaisala Sensors like the WXT520.